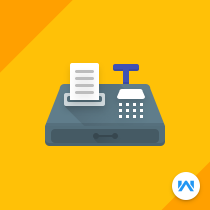 Joomla Virtuemart Point Of Sale (POS) System refers to a system where the merchant can create an order from his physical store using the POS and the order will be easily generated at Virtuemart. When you have a physical store and a VirtueMart webshop you can sell your goods at your Point of Sale without giving your sales staff access to the VirtueMart backend. All products/orders/calculation rules/customers will be synchronized into the POS. In this manner, your web store inventory will be synchronized with stock at the physical store. Option to put the cart on hold is provided. Supports Barcode reader, Admin can generate Barcode of products from "POS Products" admin panel and can print barcode label. Casher can add a product using barcode reader.